The production of steam begins with the fire, which rests on grates at the bottom of the firebox. Hot gases rise from the firebed to the upper portion of the firebox, or combustion chamber. The build-up of ash on a coal-burning locomotive is controlled by shaking the grates so the ashes fall to the ashpan below. The ashes are dumped from the ashpan hopper at the end of the run. The use of superheated, as opposed to saturated, steam brought a 25-30 percent increase in the efficiency of the steam locomotive. The boiler must be carefully managed as a pressure vessel, lest it explode. Safety valves are designed to automatically let steam escape if the boiler pressure gets too high. The top of the firebox, called the crown sheet, must be covered with water at all times. If the water level falls below the crown sheet, the fire's heat can weaken it, causing the pressurised boiler to explode. Devices like the water gauge, or sight glass, are provided in the cab for the crew to monitor water level. Low-water alarms are found on newer locomotives. A steam engine has a valve that controls steam admitted and exhausted from the cylinder at the right instant. A typical two port cylinder valve function is to admit superheated steam at one end while allowing used or exhaust steam to escape at the other. The piston is pushed forward and backward by the high pressure steam from the boiler as a result of covering and uncovering these ports in sequence. A mechanical valve gear system is used to regulate the movement of the valve and this is discussed further in the following sections. 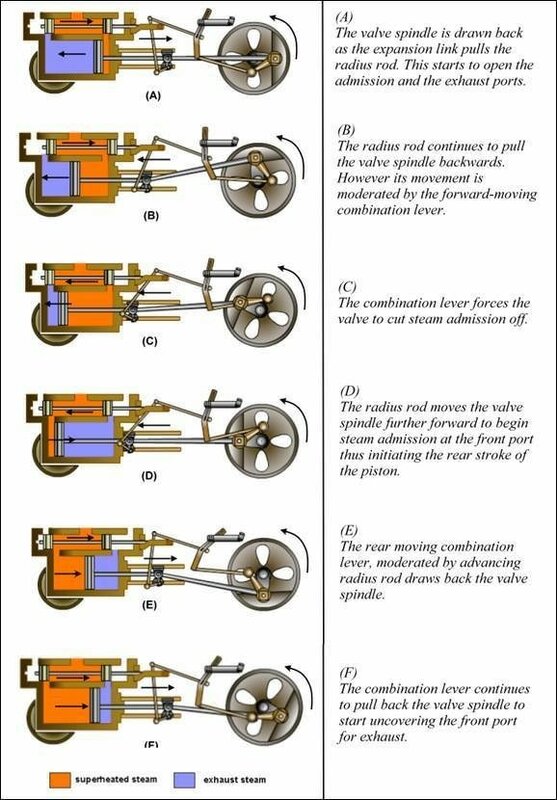 The valve gear function is clearer when a few common terms are described. Lap refers to the amount of overlap between the valve and the port. A long lap on the exhaust port gives time for the steam trapped in the cylinder to expand fully to push the piston in slow moving locomotives. Higher speed locomotives have the exhaust port open early (short lap) when the valve is in mid-position, allowing the steam to escape faster. Higher speed locomotives also have a long lead which means that the admission port is already open when the piston is at the end of its movement, resulting in sufficient steam pressure that will immediately push the piston back to begin its next movement. Cut-off denotes the position of the piston, at the moment the valve is closing the admission port. 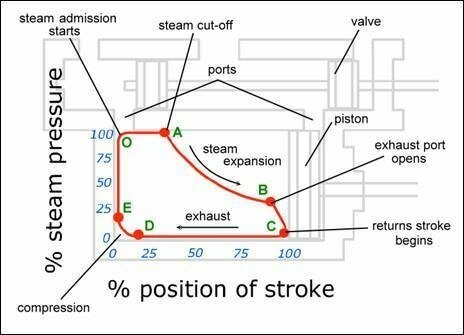 When the engine is working hard and slowly, long cut-off admits steam for most of the stroke of the piston. This will cause back pressure to the boiler on fast running locomotives. Avoiding unnecessary back pressure is achieved by reducing cut-off, where the steam is admitted for only 20% of the piston stroke. The remainder of the stroke allows for the expansion of the high pressure steam. 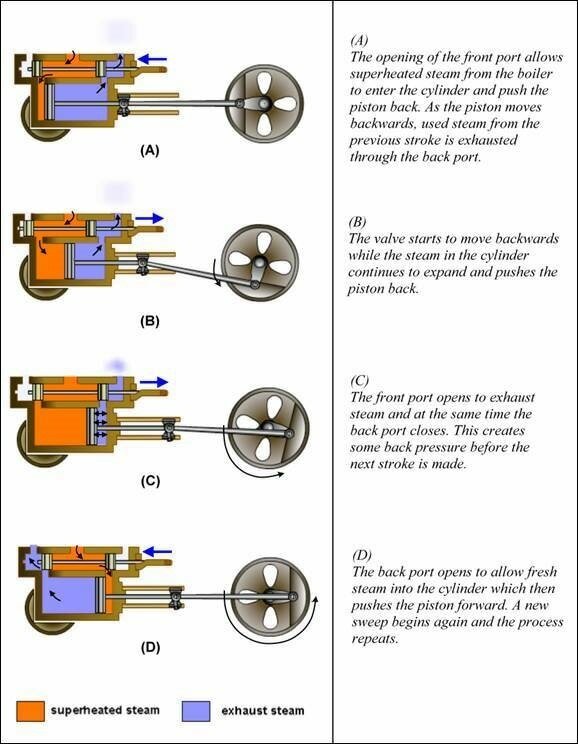 Referring to the diagrams below, steam enters the valve chests (one on each side) from the steam delivery pipes. The valves, by moving back and forth, allow the steam to enter the cylinders at times when it can usefully push the pistons. When the steam has done its work, the valve has moved opening the port to let steam escape, at considerably diminished pressure, to the blast pipe in the smokebox. The motion of the valves is derived from the crosshead, which moves according to the rotation of the driving wheels and the valve gear. The crew works the valve gear with the reversing lever, used to control the locomotive's direction of travel and the timing of valve events. The locomotive valve gear enables the driver to choose the cut-off of the steam admission and to reverse the locomotives. The control of the fore-and-aft movement of the valve spindle depends on the combination lever and the expansion link combined movements. The combination lever motion is worked by the crosshead at the end of the piston rod. It is connected to the expansion link by the radius rod. The expansion link movement is obtained from its connection to the eccentric road. The other end of the eccentric road that is attached to the crank axle causes the pendulum-like motion of the expansion link. The earliest locomotives had one pair of drivers, while the largest number of wheels driven from a single set of cylinders was six pairs. Some locomotives like the Beyer Garratts, because of hauling requirements, had a single boiler - two sets of driving wheels, each powered by a set of cylinders. Many locomotives also had a small set of wheels (either one pair or two) in front beneath the smokebox, called a lead or pony bogie to help guide it into curves. Similarly, a two- or four-wheel trailing bogie was placed at the rear of the locomotive to support the firebox. Geometry dictates that the valve is driven from the upper pin of the combination lever, the ratio of which causes the radius rod to impart a relatively large movement of the upper pin. The effect on reversing these pins for inside admission valves is to impart a slightly reducing ratio, requiring a much greater influence from the radius rod and the return crank throw, with a consequent increase in expansion link swings of around 20%. Long travel valves exacerbate the problem. The actual angular setting for the return crank and eccentric rod will now depend on the expansion link position and its tailpin. The expansion link must sit square to the radius rod in mid gear. The backset of the tailpin theoretically lessens as the inclination of the eccentric rod increases. In many inside gear arrangements where the eccentric diameter might be excessive, the pin may be up towards the expansion link trunnions and cause the backset to become positive. Equal angles of expansion link swing cannot deliver equal movements of the valve. The emphasis in design must be on timing values and not necessarily on distances. The swings of a hanger or the constraints of a die must be arranged to balance as a whole so that the valve operates as desired, and may demand expansion link swings disparate by 2o or more. In the average inside admission arrangement there is scope for reducing the pitch circle using a shorter leading return crank, such that an adequate foregear starting cut off is maintained. Even the apparently symmetrical LNER/LMS extended radius rod reverser with an equiangular lifting arm shows this trend. The same valve travel in reverse gear does not produce the same cut offs as it achieves in forward gear, simply because the valve excursions are measured against a reversal of the piston’s relative excursions. This is the reason tables of events list different figures for midgear at the minimum of the forward tabulation than those for reverse. Additionally, the working of the die in the upper half of a curved ‘rocker’ (expansion link) is quite different in detail. Longer valve travels inevitably make this area more difficult to balance. The worldwide use of a hanger for the rear end of the radius rod was extensive. It is mechanically necessary to provide in the anchor link a flexible connection. Only if the anchor link assumes the same angle at each stroke end can it impart the same amount as the crosshead stroke itself, resulting in ‘mid travel’ points that will not coincide. If the ‘mid’ points coincide the angular extents will differ. This places the anchor link as the prime Walschaerts’ adjustment component greatly influencing the shape of the curves. The design is the balancing one component’s distortions against those of the other component. Best design has combination lever ratio of pins around 9:1. The combination lever and radius rod require support either by a valve crosshead guide or by a hanger. This latter was more frequently a feature of Continental Europe practice and has the admirable function using a double arm, to provide the means of increasing valve travel without incurring large pitch circles and the angularity problems. There are small inherent timing errors at the return crank, which is normally set at the dead centres where the tailpin of the expansion link assumes the same position in both cases. Return crank error translates a variable error at all other points by the transmission of rotary to linear motion. The error increases with pitch circle diameter increase. Design minimises pitch circle diameter that will provide sufficient travel to the valve. Greater pitch circles and expansion link swings are demanded by the use of inside admission. Symmetrical layouts for short travel outside admission valves reduce the problems dramatically. The correct angular setting for the return crank has the pins at 90o to a line passing from the tailpin to the axle centre. Since the return crank pin is the only component in the valve gear that revolves through 360o, it allows the use of a roller bearing, which is inappropriate for all the other pins. Two sets of gear easily satisfy four cylinders by inserting a 180 degree rocker. Although the outer crank is displaced at 180o to the inner crank, the piston/valve relationships cannot match one to the other except at dead centres. The rocker reverses the valve travel pattern, but against a different set of crank angles. The cranked rocker and short connecting link are devised to accelerate and delay the derived valve to conform more nearly to the primary drive. The diagram below shows the arrangement used in King and Castle class locomotives developed by W.H Pearce. Matching valve events is necessary in a 4-cylinder arrangement. Beyer Garratt locomotives must have the same chassis performance in forward gear matching that of the trailing unit in reverse gear. Analysis of Beyer-Peacock valve gears reveals design in matching the events of forward and reverse gears. Most engines spend the majority of time in forward running, often allowing the bias of forward gear at the expense of back gear, which is frequently required only in full gear to back the locomotive itself over short distances. After the steam is used in the cylinders, it enters the smokebox via the blast pipe. The exhaust steam as it blasts upward toward the stack, provides a draft for the fire by drawing the gases through the flues and into the smokebox. (Fresh air enters the locomotive through open spaces at the base of the firebox.) The mingled exhaust steam and gases then leave the locomotive through the stack. It's the relatively violent escape of steam from the cylinders that produces the familiar chuff-chuff sound. The exhaust is dependent on spent steam leaving the cylinders and provision must be made for exhausting the hot gases, or smoke, when the crew has the throttle closed. A group of small steam jets called the blower is located in the smokebox for this purpose. Fuel (coal for most steam locomotives, oil for some, wood in the early days) and water are carried in the tender, a separate wagon semi-permanently coupled to the locomotive. Coal was originally fed to the firebox by the fireman with a shovel, but locomotives of any size or modernity are fitted with mechanical stokers. Some locomotives intended for short-haul use were built without tenders carrying a limited amount of their own supplies and are known as tank engines. Water is added to the boiler by two injectors (one for crew member), or an injector and a feedwater heater. An injector uses steam to force water into the boiler, heating the water as it does so. Water from the injector is still cold compared to that in the boiler, so the check valve where it enters the boiler is placed forward, so as not to cool the water near the firebox. More efficient feedwater heaters, fitted to most large locomotives after the mid-1930's, use exhaust steam to preheat the water. The pilot, which was gradually reduced in size from the "cowcatchers" of the mid-19th century, pushes aside obstructions. Locomotives engaged in lots of shunting often had footboards instead of pilots to accommodate brakemen, but these have been outlawed on diesels for safety reasons. The whistle, mounted on the dome of many locomotives, could be placed in several different positions. Mechanical bell ringers or air horns replaced the simple action of a crewman pulling on a cord attached to the bell (United States).